I get it, the year has only just begun so everyone is fully committed to the goals they have made so far. Gym memberships spike in December and begin a sharp decline just after New Years as people guiltily confirm with themselves that they were never going to go. I always felt like that is what would happen to me if I joined a gym. I have a strong habit of becoming essentially addicted to something and being very devoted to it for a certain amount of time before I bit by bit get distracted by something else and move onto that. So I would go for a little while and then I would stop, and undoubtedly continue paying for membership in the belief that I will go back. I started doing Kayla Itsine's Bikini Body Guide. Which you've probably seen on social media #BBG. I wasn't ever planning on getting into the BBG challenge, but seeing the before and after results of everyone is so inspiring! No to mention how brave everyone is for showing off their pre workout bodies. I'm using the iphone app for it at the moment, it cost $20 a month to use which while it isn't the cheapest. It's much cheaper than gym membership, and I'm actually using it. So in that way it's worth every penny. I love all the functions, and how i'm always watching the little animations on how to do an exercise. I like the planner telling me what I need to do today and keeping track of photo progress. Overall I'm a lover of cool tech and handy apps. What can I say, my iphone is always close at hand. 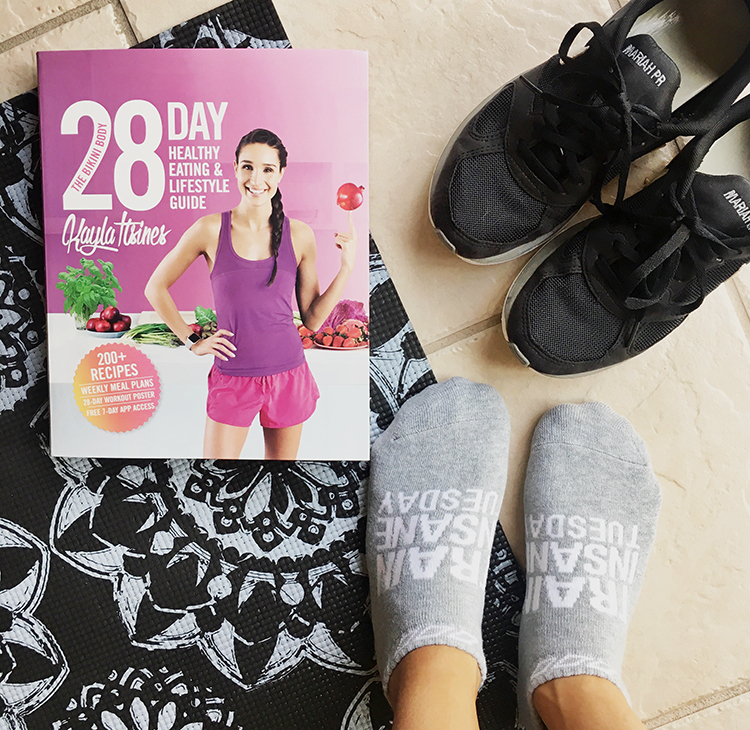 I recently posted three fitness challenges I was doing, now I'm doing something similar with the BBG, Yoga Revolution and I'm still doing Couch to 5k. I find the C25K app is really handy for interval running, whether I'm building endurance or just want to do some cardio. I'm sure my motivation will wane during the year but as long as I can snap out of the slump and get back into it I'm sure it will be okay. I've still been eating a lot better, something that I've been improving at. So that I'm proud of. I don't think I'm going to suddenly slip back into eating garbage foods again as I don't even miss it. 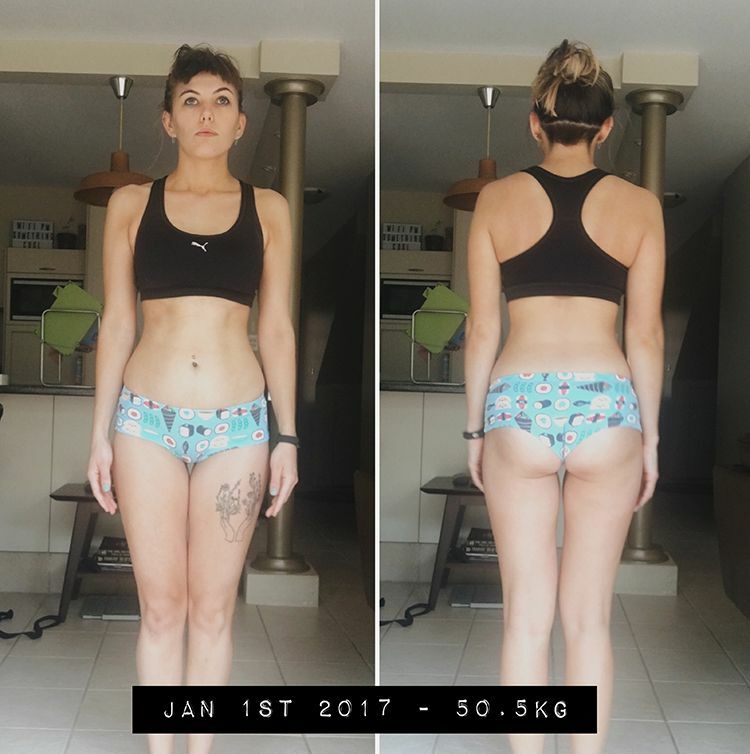 Now I'm going to share my before photo, the front and back of me, that I took on January 1st 2017. Apart from the fact that my face looks weird and probably slightly hungover, there I am. About 2.5kg down from the weight that I started at a few months ago. My fitness goals have moved from any weight loss to now just getting toned and building some muscle. Which in turn makes you look slimmer anyway. Toning my legs, stomach and arms are top of the list. I didn't take these photos with the thought that I would be posting them on the internet. But what better way to embarrass myself into exercising is there than this? Doing it for the after photos. That's the motivator right there. I want to have an amazing after shot of my booty. Alongside my resolutions, I've set a handful of mini goals for me to complete during the year. I might talk about a few of them in individual upcoming posts. So wait and see! It sounds like you're really inspired and motivated to keep fit, well done! I'm doing Adriene's Yoga Revolution too (although a few days behind, as always!) and I'm planning to get back in the gym at work again soon - I'm really lucky to have that and to not have to pay membership for it, so I want to make the most of it :) Excited to see how you get on with this! looking amazing! i might need to look into this BBG, ive not heard of it before! I've always wondered if Kayla's plan was worth it. Especially since it is $20 per month, but I can't wait to see your journey to get toned. I love Kayla Istines but have never actually completed the whole thing.... maybe this year! You go gurl! I am hoping you determination will rub off on me soon! Great post & how cool are your undies?! Haha I used to do BBG & it worked great but I couldn’t keep up with the cleaning eating since my mom cooks for us. It definitely works so I can’t wait to see your after photos! I think I could definitely do with her book though so I could start cooking up my own food haha Good luck!